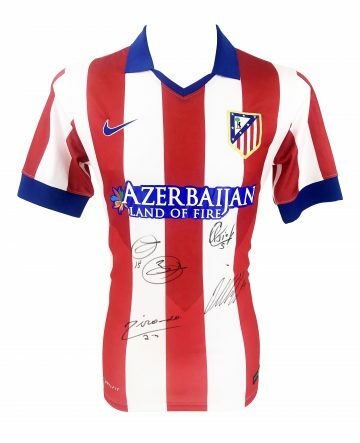 Browse our signed Atletico Madrid memorabilia including signed Atletico Madrid shirts, balls, photos & prints. All with worldwide shipping and free UK delivery & a certificate of authenticity. Many with photo proof! Colloquially known as Atletico or Atleti, superclub Atletico Madrid knows a thing or two about winning at national and European championships. Their reputation for achievement against all odds is infamous – they are the third most successful club in Spanish football after Real Madrid and Barcelona. The club is relatively young, having only been founded in 1903. It actually started out as a youth branch of parent team Athletic Bilbao, and remained as such until 1921, when it gained independence and its own stadium. Domestically Atletico hhasa scoresheet to be proud of. 10 La Liga wins, 10 Copa del Rey triumphs and two Supercopas de Espana have secured their spot in the Spanish footballing hall of fame over the years. Meanwhile, in Europe the club has also consistently excelled – winning the UEFA Super Cup and Europa League three times a piece. Atletico Madrid have a long-running rivalry with neighbouring club Real Madrid, which historically began due to the clubs’ respective locations. Atletico stood in the working-class part of town, whereas Real Madrid was situated within a wealthy neighbourhood on the northern side of the city. Now the rivalry is more symbolic and sporting – and to this day the Madrid derby is hotly anticipated by spectators and fans all over the world. Atletico’s long history is rich with culture and interesting quirks. The club has been known by various nicknames since its inception in April 1903. First came ‘Los Colchoneros’ or ‘The Mattress Makers’ – a nod to their striped kit which resembled mattresses of the time. This was followed by ‘Los Indios’ in the 1970s, after the club signed several South American players after restrictions on signing foreign talent were lifted. Our signed Atletico Madrid football memorabilia collection includes unique and exclusive items carefully sourced for their quality and authenticity. Here you’ll find signed Athletico Madrid shirts, football boots, balls and mounted displays featuring signatures from some of the squad’s star players. Commemorate championship wins and remember iconic moments with these extra-special finds, guaranteed to retain value over time thanks to certification of authenticity.